This notice provides you with details of how we collect and process your personal data through your use of our site https://www.peakwindows.ie/, including any information you may provide through our site when you purchase a product or service, sign up to our newsletter or take part in a prize draw or contest. Peak Windows and Doors Limited is the data controller and we are responsible for your personal data (referred to as “we”, “us” or “our” in this privacy notice). 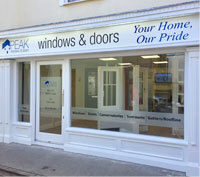 Peak Windows and Doors Limited uses Google Analytics to help analyse how users use the site. The tool uses “cookies,” which are text files placed on your computer, to collect standard Internet log information and visitor behaviour information in an anonymous form. The information generated by the cookie about your use of the website (including your IP address) is transmitted to Google. This information is then used to evaluate visitors’ use of this website and to compile statistical reports on website activity. • Enter a contest, sweepstake, competition, prize draw, promotion or survey. In this section, we have set out a description of the ways we intend to use your personal data and the legal basis on which we will process such data. Lawful basis: (1) Necessary for our legitimate business interests, provision of administration and IT services, network security, to prevent fraud and in the context of a business reorganisation or group restructuring exercise. (2) Necessary to comply with a legal obligation. You may post follow-up questions. If you have a question, chances are you are not alone. Others are likely thinking similarly. Therefore, I would rather receive your comments on Peak Windows and Doors Limited than via email. It is a better use of my time to address everyone at once rather than answer several similar emails. Peak Windows and Doors Limited reserves the right to delete your comments. This is my blog. I don’t have an obligation to publish your comments. The First Amendment gives you the right to express your opinions on your blog not mine. You grant Peak Windows and Doors Limited a license to post your comments. This license is worldwide, irrevocable, non-exclusive, and royalty-free. You grant me the right to store, use, transmit, display, publish, reproduce, and distribute your comments in any format, including but not limited to a blog, in a book, a video, or presentation. CHANGE NOTICE: As with any of our administrative and legal notice pages, the contents of this page can and will change over time. Accordingly, this page could read differently as of your very next visit. These changes are necessitated, and carried out by Peak Windows and Doors Limited, in order to protect you and our Peak Windows and Doors Limited website. If this page is important to you, you should check back frequently as no other notice of changed content will be provided either before or after the change takes effect. COPYRIGHT WARNING: The legal notices and administrative pages on this website, including this one, have been diligently drafted by an attorney. We at Peak Windows and Doors Limited have paid to license the use of these legal notices and administrative pages on https://www.peakwindows.ie/ for your protection and ours. This material may not be used in any way for any reason and unauthorized use is policed via Copyscape to detect violators.